Artifact 1.1 Call to Arms update patch notes include news about new decks, automated tournaments, and more. 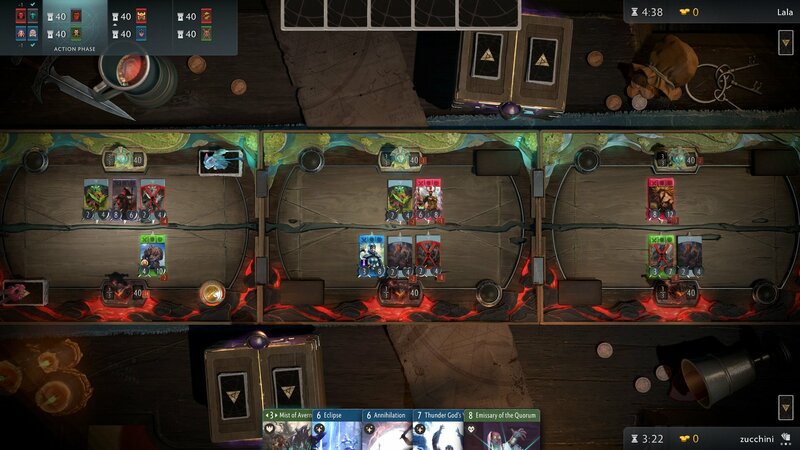 Valve's latest game release, Artifact, has gone live with the Call to Arms 1.1 Update, which expands the current event and adds new decks as well. Two new Artifact decks come along with the update: the mono black Dark Aggro deck or the spell-heavy mono blue Death From Above. The Dark Agro deck is meant to help you "capitalize on your opponent's slightest weakness" and looks like a frustrating time for your opponents. "You have sworn The Oath to ensure victory. Knock your opponent off balance by disrupting their mana. Every unit between you and your opponent’s tower is a target for your turrets and cannons, every hero marked for Assassinate. And when you create your opening, no one hits the tower harder than the fearsome Sorla Khan with her Assault Ladders," reads the official description. The Death From Above deck lets you "annihilate all who dare oppose." "Creeps and heroes may be strong – but spells are power incarnate. Your enemies dare not mass for an assault, because of the destructive might of Annihilation. Eclipse and Mystic Flare disintegrate your foes with ease. Amuse yourself by manipulating your foes to swing at the wrong target or even fight each other. Finally, obliterate the opposing tower with the mighty Bolt of Damocles," the deck's description says. For anyone who's already mastered the Call to Arms decks, you can also participate in a new and different challenge in the form of Random Mode. Random Mode finds you receiving random Call to Arms reconstructed decks for having conquered the game in your own unique way. Build the highest win streak possible with these random decks and you'll be on the path to amazing things. Additionally, you can expect to be able to compete against the new leaderboards, which let you track your top win streaks with each deck you use. They reset every two weeks, which lets you make sure you have a chance at setting new records every couple of weeks. You'll want to test your skills, too, especially as Open Tournaments have just gone live as well. Open Tournaments are automated tournaments that don't last very long, and let you get instantly placed in a tournament with others without the need of lengthy setup or anything like that. The first challenge has players forced to use decks only with common cards, so that should be a fun tournament for all involved. Alternatively, the Free-for-All tournament gives players 3 hours to battle as many opponents as possible, with each opponent able to be fought twice. The player with the most individual victories will be named the winner. You can use this same format for user-created tournaments, too. The update is also sprinkled with bot updates, tweaks to the chat wheel, and a smattering of other fixes. You can read the entirety of the patch notes at the official Artifact blog. Happy gaming!